Libby the kitten used up at least one of her nine lives after she was abandoned in a country lane in Fareham in the freezing cold. 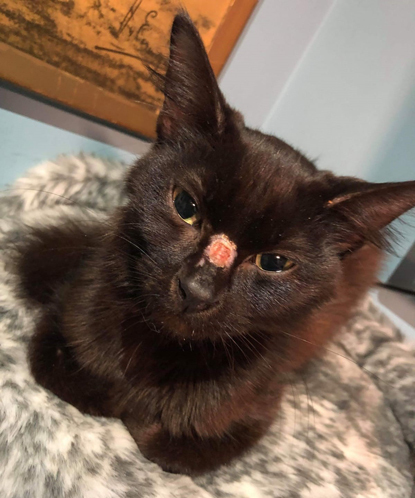 Volunteers from Cats Protection’s Fareham Branch found her cold, hungry, underweight and with an injured nose two weeks into her terrifying ordeal and were able to get her to safety. Libby’s four siblings had been rescued a fortnight earlier when a member of the public contacted Cats Protection to say she had spotted some kittens in a lane near Botley Park golf course. Lorri Seymour, Coordinator of Cats Protection’s Fareham Branch, said: “It was after 8pm and in the middle of nowhere, so it was very dark and scary – there’s just fields and a narrow lane so we only just got the car down there. “Members of the public had managed to catch two kittens and we used traps* with food inside to catch two others – it took a couple of hours but the kittens were really hungry so they were eventually tempted inside. By 1am Lorri and fellow Cats Protection volunteer Trudi Farrow had taken the rescued animals to safety, but remained concerned there was another kitten who needed help. There was no sign of her for two weeks, but against all the odds the same member of the public who had originally spotted the animals called again to say she’d seen a black kitten in the lane. "Trudi, her husband Mark and I headed straight back to the lane and, thankfully, this time we managed to find and catch the remaining kitten,” said Lorri. 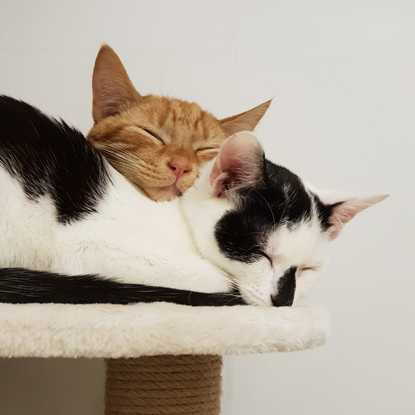 Lorri has been caring for the first four kittens at home – despite her partner being allergic to cats – and a volunteer fosterer is caring for Libby, feeding her a teaspoon of food every hour since she was rescued. By the time Libby arrived, her siblings – some of whom might actually be similar-aged kittens from another litter – were recovering well, gaining weight and quickly gaining confidence. They were all given full health checks, flea and worm treatments, and a blood test and antibiotics for some of the kittens. Because they were found near Bishop’s Waltham, volunteers named the kittens after bishops and also people named Bishop: Lily (Bishop, American author), (Thomas) Becket, Desmond (Tutu), (Lord) Ramsey and now Libby (Lane). 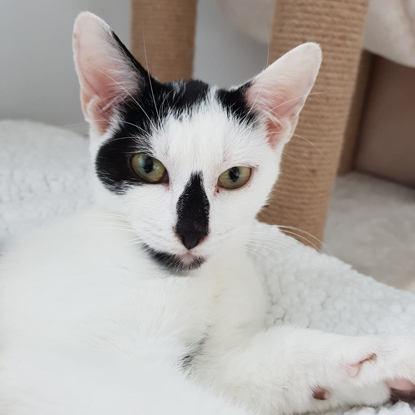 The first four kittens, thought to be about 12 weeks old when they were rescued, have already been adopted and moved to their forever homes – and the branch has a list of people waiting to adopt Libby when she’s well enough. “The number of cats being dumped is a major problem for us because it can take weeks and sometimes hundreds of pounds to nurse just one unfortunate cat back to health,” said Lorri. “We seem to be living in a throwaway society where some people think nothing of just dumping cats. 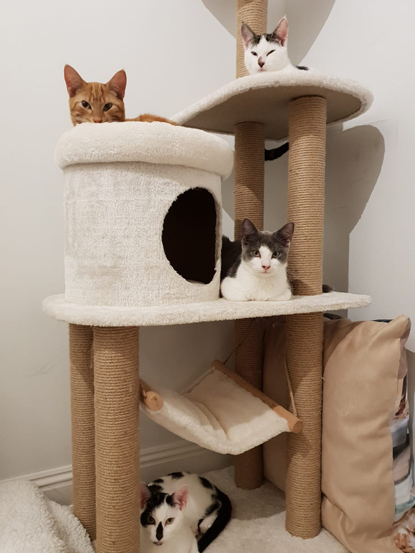 *Cats Protection’s Fareham Branch was able to buy new traps which were used in this rescue and other vital equipment thanks to a grant from Support Adoption for Pets. So glad there is a good ending to this story. If people can't look after a litter of kittens, don't abandon them to the elements, hand them in to CPL or another animal charity. So good to hear that there are people out there who will go the extra mile to look after abandoned cats. Really appreciate all the hard work the Cats Protection do and will continue to support this worthwhile charity for as long as possible. I was chosen by an abandonned kitten that was found in a small box five years ago. He was infested with lice and was quite run down so I cared for him in the best way I could. I made plans for him to be neutered to help his life and now he is a very happy cat that is a very affectionate companion. Well done and thanks to Lorri and the wonderful volunteers who saved these kittens. So glad the first four kittens have all been adopted and there's a list of those who want to adopt Lily. Hope she recovers soon and is able to go to her forever home very shortly. A heart-warming story but with the underlining serious message that we should always get our cats neutered. I am so glad these lovely kittens have been found. How nice that Libby has been named after our former Bishop Libby Lane here in Stockport. Great to hear. You do such wonderful work. Well done on saving all 5 kittens. My heart goes out to Libby as that last night all alone, she must have been so scared. Just sad at what people can do.. Thank goodness for all the kittens and their mother being rescued,big thank you to all concerned.A happy ending to what could have been a sad ending.God bless you kind samaritons. I too have been involved in rescuing cats and kittens that have been dumped. How can people do this to cats, kittens and other animals in Britain? The cost of neutering a kitten is cheaper than feeding a cat and kittens plus providing litter for them. It beggars belief that people are so cruel and uncaring in this day and age to do this to innocent animals. Such a shame these cats and kittens alike are thrown away like rubbish but lovely to see these wonderful stories of help and nurturing.So glad I'm helping these and others in similar situations. Thank you for caring so much. I will always support your organisation. My two rescued moggies are happy, warm and well fed. It is always lovely to read a story with a happy ending. Well done. They're all so lovely and l'm glad that Libby is making a good recovery. My very first cat was from the Cat Protection League - as it was called then - and l've had cats ever since; along with - usually - 2 dogs as well!